We’d love your help. Let us know what’s wrong with this preview of The Model Thinker by Scott E. Page. To ask other readers questions about The Model Thinker, please sign up. As a professional Business Intelligence Analyst (BIA) this is the perfect non-fiction book for my desk. I do data aggregation, reporting, and analysis at my day job. And we are constantly trying to determine what the best correlation, representation or model is for analysis the data available to us. In this case Pag As a professional Business Intelligence Analyst (BIA) this is the perfect non-fiction book for my desk. I do data aggregation, reporting, and analysis at my day job. And we are constantly trying to determine what the best correlation, representation or model is for analysis the data available to us. In this case Page is able to eloquently argue that in today's world of "big data" we need to be more aware of what options are available to us for analysis. It's no longer appropriate to use one model to analysis a problem. Instead we need to leverage the multi-model approach and look at complex issues, problems or phenomena (as he calls them) from many angles. As the world has gotten more complex, our data has gotten larger and more granular; which means we need to look at it from many different perspectives. 3) A real-life, relevant example of using the model. The best part of reading any portion of Page's epic selection of models is easily the examples. From health care to criminal form to food quality to the stock market to population growth; we are given applicable scenarios to understand the nuances of each model and why it's the best choice. Plus there are tons of little tidbits and facts that are fun to share at cocktail parties (or if you're me, in random elevator conversations) in here! There is one thing that really surprised me in The Model Thinker and that is Page's emphasis on creativity. As someone who has a BA in Communications, Marketing & Design, and used to work in the magazine industry, I was surprised to find that my current Analytical career had such a basis in creativity. Reflecting upon Page's statements and my job I realized that he is right. When we program/code, develop visualizations or infer outcomes from data; we are looking at something and creatively manipulating it. Perhaps this explains how I went from an Art Director to a Analyst in one lifetime. This is a book that I will be purchasing for my office shelf. I have already gone back to my eARC copy multiple times to look things up and to continue learning the models. It's not a book you will likely read cover to cover at any given time. But the first 50 pages of introduction and concepts are superb and well worth reading in order. After that you can jump around to the models you are most interested in, or if you're looking for the right solution for data crunching, read the intros to each chapter to determine if there might be applicable use to your situation. I know that The Model Thinker has already been picked up by some mainstream Universities and Colleges as a required textbook and certainly I can see why. In one book you gain the knowledge of hundreds of years worth of calculations and analyzation. Whether you currently work as a Data or Business Analyst, have a desire to learn to use big data, are a programmer or just a geek that loves graphs; The Model Thinker is likely to fill a void, you didn't even know existed, by giving you more models, examples and calculations than you will ever need. Mel (Epic Reading) Welcome Holly! I really like the subject of this book. Model thinking is one of the best subjects I have taken in Coursera. The concepts are really useful and practical. It helps you to frame your thinking about numerous things in our world. I would not give this book a 5 stars because I think this subject is best convey through other format like videos, lectures, or course. The topic is a bit complex especially for those who ate not comfortable with numerical reasoning. By putting it in book format it limited I really like the subject of this book. Model thinking is one of the best subjects I have taken in Coursera. The concepts are really useful and practical. It helps you to frame your thinking about numerous things in our world. I would not give this book a 5 stars because I think this subject is best convey through other format like videos, lectures, or course. The topic is a bit complex especially for those who ate not comfortable with numerical reasoning. By putting it in book format it limited its audience. Since it is already written as a book, my suggestion would be to have more illustrations instead of text. This would aid in easy understanding. Professor Page certainly introduces some interesting concepts in The Model Thinker. His overall aim here is to get you to use multiple models in your thinking, and the plethora of models provided will be an aid to any person out there. That said, I found it rather difficult to get through. My attention wandered far more than I thought it would. I think that is just the nature of non-fiction sometimes. Even when interested in a subject, a book on it is not always enjoyable. Thus, my star rating sh Professor Page certainly introduces some interesting concepts in The Model Thinker. His overall aim here is to get you to use multiple models in your thinking, and the plethora of models provided will be an aid to any person out there. That said, I found it rather difficult to get through. My attention wandered far more than I thought it would. I think that is just the nature of non-fiction sometimes. Even when interested in a subject, a book on it is not always enjoyable. Thus, my star rating should be taken to reflect an emotional reaction to this book rather than a reaction to its content or construction. The title of this book is a little misleading. 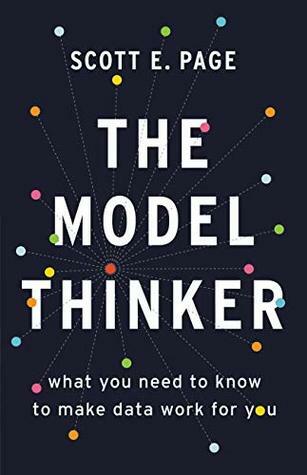 While the author provides a clear, informative overview of the different types of models and the kinds of problems they are regularly used to solve, he never touches on examples of where you might want to apply them. I was expecting a little more guidance on what this information means to me. In spite of that, I could see this being very useful, and it did make me want to read more on some of the topics covered here. Basically sums the "Model Thinking" Course by the same professor. And I guess that regardless of one's background, and with enough openness, you can discern magical phenomena (obviously it's just that we ignore how stuff work), while reading this book. Now back to the oldest idea about models as mere reductions, and are not reliable or so: Yes they are reductions, and are reliable for the assumptions, to some extent, about those same reduction. "To become wise you’ve got to have models in your head. And you’ve got to array your experience—both vicarious and direct—on this latticework of models. The good news is it's better to have scattered knowledge about a thing, than no knowledge at all. Every fundamental law has exceptions. But you still need the law or else all you have is observations that don’t make sense. And that’s not science. That’s just taking notes. There are some useful models in here that I've been able to apply directly to my work. The overall thesis—using many models to explain, predict, and act is more helpful than using one—is something that really came into focus. It's a very dense book with "textbook" style writing. I wish it had more narrative prose to make the reading more enjoyable. There aren't as many real world examples in the book—it's mostly math and visuals of the models themselves. A good reference for knowing model names. Nothing more. It is not for people without basic statistics, computer science, and math knowledge. And It is not for people who were looking for advanced models. I was not really sure who the author's intended readers are. On the plus side, the book gives a very broad view of the models used in various fields--from economics to epidemiology. This is a great source of wisdom. 25 something general prediction models with simple math explanation, good examples and comprehensive insights. Many model approach reasonable as nothing else in this world. Invaluable food for thought!